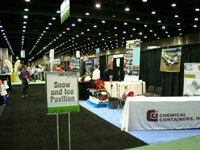 At October 27-29, Fujii participated GIE+EXPO in Louisville. We displayed Si1022S in "Snow and Ice pavilion"　and had a lot of visitors from USA, Europe, Japan and so on. Every visitors listened the explanations about snowbrower from salespersons with interest. *Models used: SA706M1, Sk810M, etc. 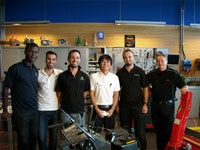 I visited the new distributors in Czech Republic, Italy and Finland for technical training of FUJII snow blowers. I told the way of maintenance and control the machines for the serviceman's of the companies. Everybody confirmed them hard for preparations of the winter. Fujii's snowblowers work hard all over the world. *Models used: S Type, etc. Tookamachi's snow festival is quite well-known, but many other communities in Niigata also hold their own snow festivals. Ushinootani is one of such communities. Their snow festival is not so big as that of Tookamachi, but it is a "hand-made" festival organized by the community residents working by themselves. These photos were taken during the setup. 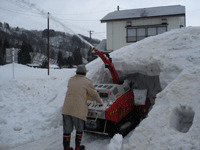 Fujii's snowblowers are used to build snow slides and snow caves. 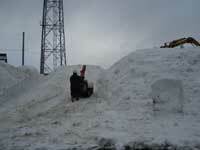 but local people enjoy working and playing with the snow more than anybody else. "Fujii's snowblower is free from breakdown and very reliable." This is Shiotani Community in Ojiya City, Niigata Prefecture. This community has such a heavy snowfall that the local university distributes information on the status of snowfall through the Internet.Therefore, Fujii's snowblower is a must for this area. Mr. Masafumi Hoshino, who lives in this community, provided snow to an event in Mishima City, Shizuoka Prefecture, as a token of gratitude for the warm support extended by Mishima City during the aftermath of the Chuetsu Earthquake. He used Fujii's snowblower at that time. His snowblower is more than 20 years old, but is "free from breakdown and very reliable", according to Mr. Hoshino. Mr. Hoshino is still working to dispose of snow with Fujii's snowblower even in the middle of April. We hope he will keep up his effort for a few more weeks until the snow completely melts away. Fujii's snowblower is indispensable for removing snow from the large car park. 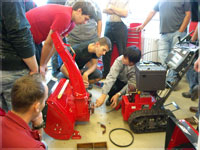 Inspection and maintenance of snowblowers are done in many places in the middle of November. The snowblower of Komanoyu Inn, located in Kiso-Machi, Nagano Prefecture, has been checked to be ready to start up in the busy winter season. The president (in the photo at the bottom) who says, "We cannot do without this snowblower. ", seems to find it very useful. The Inn opens early in the morning, and the staff has to remove the snow from the large car park to facilitate the entry and departure of tourist buses. On the day of our visit, the president kindly found time between his busy work schedule to pose for the photo, but went back to his work immediately after the photo-taking. Fujii's powerful snowblower is a great help for the staff to start the day of this popular inn. 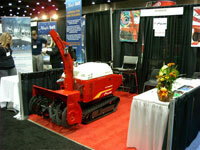 Fujii exhibited snowblowers, grass mowers and boom lifts. The Farmer's Convention is an annual convention held in Akita Prefecture. This year's Convention is the 130th Convention. With the cooperation of Itochu Farming Machine Co., Ltd., we exhibited snowblowers, grass mowers and boom lifts – a total of 13 products of our own. We also conducted demonstrations with detailed explanations.Since it was one of the rare opportunities that they can take time to examine our products, the visitors were all very attentive. Many of them seemed to be interested in the snowblowers because Akita and its neighboring prefectures have a heavy snowfall. One of the users of our snowblower, who lives in an area of heavy snowfall, came to the exhibition and commented on the selling points of our snowblowers, saying "I am happy with the biting performance and snow throwing capacity of the machine." This year's winter is approaching. Get a powerful partner to lessen the workload of troublesome snow removal– Fujii's snowblower. The operability and durability of Fujii's snowblowers are highly appreciated. Yahiko Shrine, located in Yahiko Village, Niigata Prefecture, uses a total of seven snowblowers of Fujii of different sizes to remove snow from the large shrine ground. Yahiko Shrine is one of the most famous Shinto shrines in Niigata and it is also a venue of the Yahiko Chrysanthemum Festival. Since the shrine ground has a lot of steps, snowblowers are set up at different locations during the snow season. On the day of our visit, the engines of the snowblowers were started up after a long interval for the inspection and maintenance before winter. This shrine has traditionally been frequented by local people and boasts the largest number of visitors of all the shrines in Niigata. The shrine staff said that they take utmost care to ensure safety when using the snowblowers. They also said that they find them very useful because they can promptly remove even wet and hard snow and are sturdy and durable. In particular, they liked the snowmatic function (a function to automatically keep the snow removing part horizontal). They seemed to be very happy with the operability and durability of the snowblowers. The Yahiko Chrysanthemum Festival is held every year from November 1 to 24.